The island school is a place of change. We come back older, taller, and dirtier – but the most significant change happens within ourselves. We have experienced things that can’t necessarily be explained to those at home, at least not easily. As our semester comes to a close we have begun to look into how we have changed, both personally and as an Island School class. While observing changes in ourselves we strive to understand how these changes occurred. 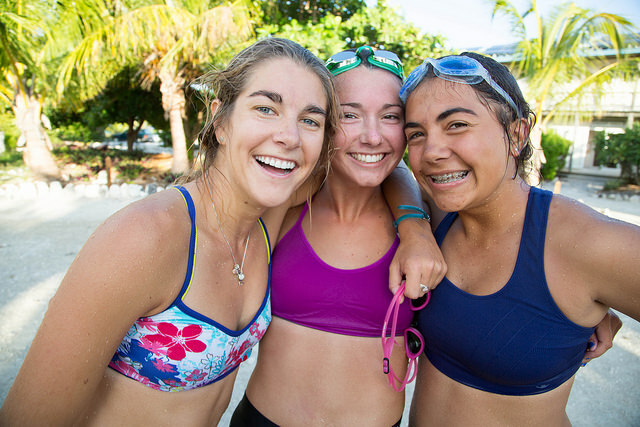 Many students might tell you that it is from their solo or from being away from home or living in a dorm but I think, at least in my own case, that this change has come from a collection of every moment at the Island school. Most people do not have one moment that defines the inevitable transition during their IS experience. 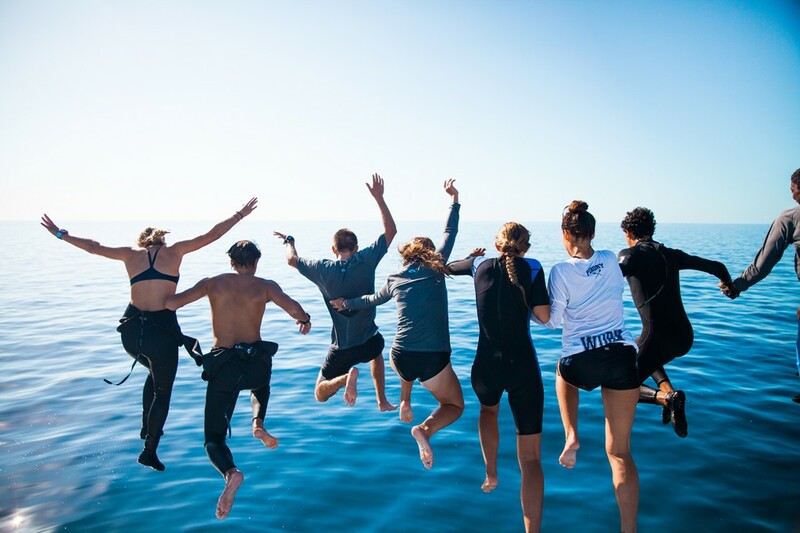 This collective change comes from absorbing the numerous little things that IS has to offer: jumping off of High Rock, swimming in Current Cut, going to the marina store for some much anticipated snacks. The transition home that faces us is depicted as being very difficult. We will leave this place that we have learned to love in the past ninety some days. We will miss it but we are also glad to get home after our long journey. On this note, I ask our loved ones that, once your Island School grads get home, you give them space to transition and that you are patient. This transition can be tough for many students so it is not uncommon for them to take time to jump back into their daily routines. 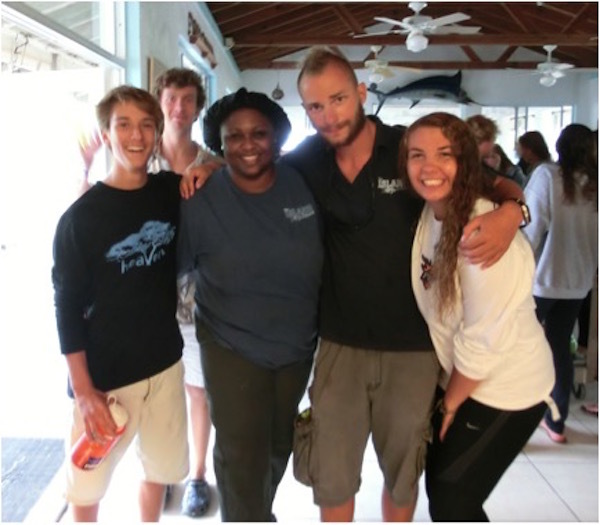 And a tip to future students: make every moment of the Island School count. Take advantage of every situation. 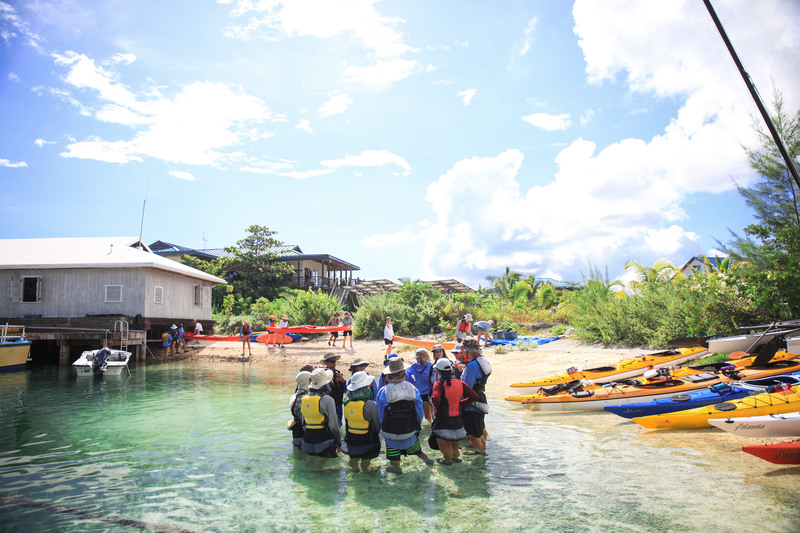 If you were at boat house cut on August 31st at around noon, you would have seen thirteen eager students holding paddles up towards the sky – the sign that we were all ready to depart on our three day kayak trip. When we first set off, we were traveling at a speedy pace, with Helen Roosevelt leading the diamond shaped pod, Justin Box and Katie Koch acting as the sides and I was holding up the rear. Eventually, Catherine Klem and Ian Overton, our leaders for the three days, gave us the signal that we would stop for lunch. When we pulled up for lunch near the lemon shark pen that was about three miles down the coast from the Island School, everyone was tired, but we all helped set up the lunch tarp and lay out our food. Then we took our PB&Js into the clear blue ocean that was the perfect temperature for lunch in the water. We soon set off again and after passing two or three mangrove-ridden islands, we arrived at our campsite. We all got out of our kayaks and handed out jobs. With speed and elegance, we brought the kayaks up on the shore, unloaded the group gear, and flipped the kayaks for safe keeping through the night. After all of the group gear, food, and kayaks were taken care of, we then moved on to setting our hammocks that we would sleep in for the night. Later, we all helped gather firewood for our fire that would be used for cooking our meal of rice, beans, and vegetables. As a treat, we were surprised with marshmallows that we roasted over the fire and cooked to a golden brown. That night, everyone brushed their teeth and attached their dry bags to trees in case a sudden Bahamian storm rolled in. Then we all zipped up our bug nets to our hammocks under the light of the full moon, and we fell asleep. On day two of our kayak trip, we headed out to the blue hole. Once we finished the two and a half mile trip down the coast, we pulled into a little bay and attached our kayaks to the nearby mangroves. Then, we all helped in setting up lunch of tortillas, peanut butter, and jelly were all laid out on the tarp and we all feasted awaiting the upcoming blue hole snorkel. 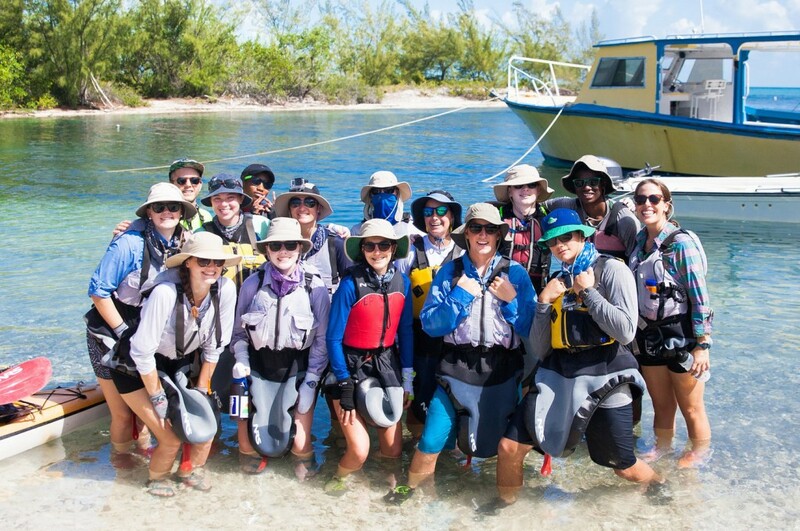 We put on our snorkeling gear and out to the blue hole. We were all in pairs of twos (the buddy system) and swimming eagerly to the site. 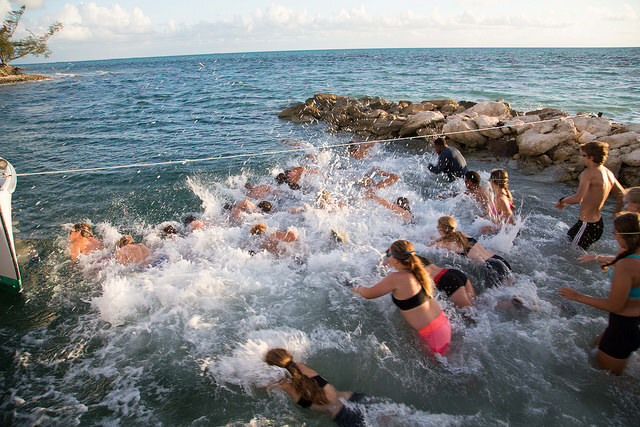 When I approached, I saw the white sand with some seaweed on the bottom, Cam Reisinger and Owen Ryerson were on either side of me, and then I saw the blue hole. Suddenly the sand dropped off into a black abyss. 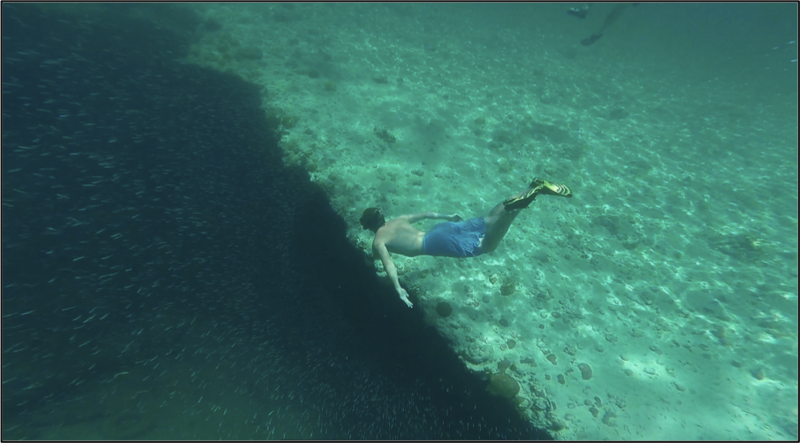 The blue hole was covered in coral and filled with fish of all different shapes and colors. We dove down and looked around to see more coral that had fish nibbling on the ends of it. Everyone was stunned at the amazing blue hole and all of the life that was around it. After we snorkeled in and around the blue hole for twenty or thirty minutes, we went back to our boats and kayaked back to our campsite. The next and last day of our trip, everyone was sad to be packing up their hammocks because, even though it was only two nights, everyone had an amazing time and we were all sad that we had to leave. After we had breakfast and packed the kayaks, we were on our way. We paddled past the shark pen to a new lunch spot, about half way between our previous campsite and the Island School. We all ate the PB&Js as we had the previous two lunches, and we played a game in the little bay where our boats were beached. After thirty minutes or so, we left for The Island School. Once we arrived, we were all tired and a bit sad that we were at the end of such and incredible trip. We put our boats away and gave everyone high fives for having finished and for such an incredible trip. Now, we are all excited about going on our eight-day trip with new people and creating new memories. JJ, Stephen, Gus and DCMS student Cristian hard at work during Community Outreach. 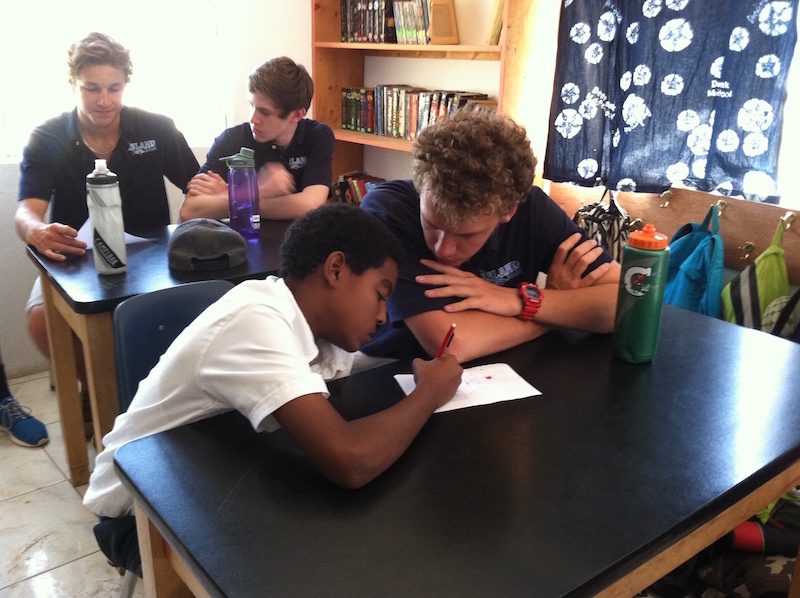 At the beginning of the semester, each Island School student is paired up with a ‘buddy’ from Deep Creek Middle School. Every Thursday at precisely 1:10 we meet at the flag pole and prepare to travel to DCMS to help them work on their final projects. There are a variety of projects ranging from AIDs and HIV awareness, to self-image for girls. Each group is a team of 6, three Deep Creek Middle School students (9th, 8th, and 7th graders) and their three Island School buddies. This past Tuesday was no ordinary Community Outreach. Our group piled into a van and headed over to Tarpum Bay primary school for our drug awareness event led by Patron, a 9th grader at DCMS. Our group of 6 stood up in front of a class of 6th graders for the culminating event. We performed a short skit to educate about peer pressure and drug use. After the skit, Patron asked the kids questions about what they had just learned. It turns out we had left the questions we prepared at the school so we all had to wing it and come up with questions on the spot. The kids were eager to participate and with each question, around 10 hands shot up. After we exhausted the questions, Patron took the kids to the basketball court to show them the safe and fun alternative to drug use. We played three different basketball games which lasted around an hour and a half. Towards the end we got to take a break and cupcakes, lollipops, and lemonade were handed out. The kids were very excited to be outside, and it turned into a family event where cars stopped to watch and siblings came to join us. Although it veered a little from the drug education, overall everyone had a great time and Patron was so proud of how well his big event came together. The group came back to the school with a sugar high and exceeded expectations. We had missed advisory time but it was well worth it. Our class had turned into an adventure and our buddies had become our close friends. 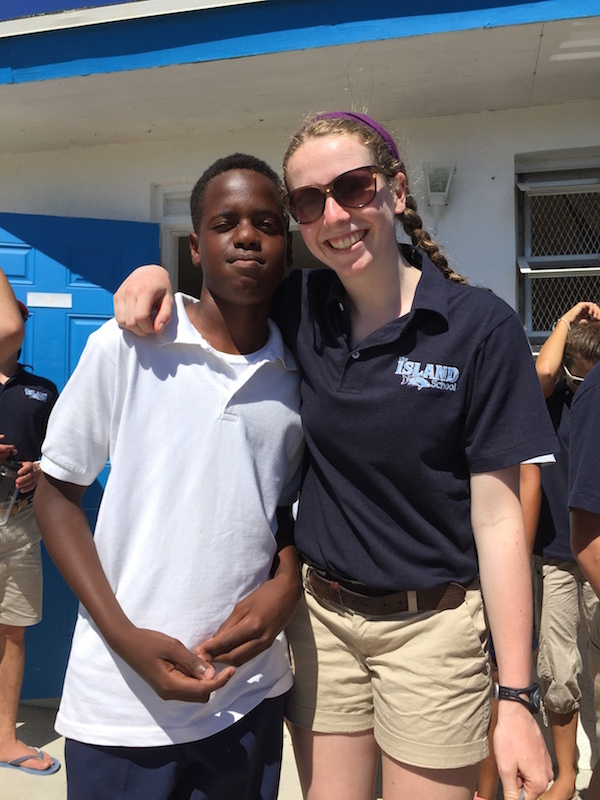 Colleen and her DCMS buddy Kenvado pose for a picture at the end of Community Outreach.